Cold resetting a printer resets the printer to factory defaults. Please note: Any settings you make at the printers control panel will be reset to factory defaults, including the IP address if you have a JetDirect card installed. Remove the JetDirect card while you cold reset the printer if you don't want to erase the JetDirect card's settings. You can also reset the NVRAM. Resetting the NVRAM will clear the page count and reset the service mode settings to factory defaults. On printers with a display panel you need to enter service mode to manually change the information stored in NVRAM. On printers that don't have a display panel, such as a 5P, 6P, 2100, 2200 there is a different procedure outlined below. Cold resetting the printer is simply a matter of turning the power off, holding down the GO or Online button while turning the printer on. Resetting NVRAM settings must be done manually through service mode. See entering service mode. Turn the printer off and then on. When the printer begins its memory count, press and hold down the Checkmark button until all the main LED signal lights illuminate and stay illuminated. Then release the Checkmark button, and use the Up/Down arrow keys to find the Cold Reset option, then press the Checkmark button again to choose that option. Printers with no display panel. HP 1100, 1200 - While the printer is on, press and hold the Go button for 5 seconds. This will reset the printer. To reset the NVRAM. Turn the printer off. Press and hold the Go button for 20 seconds while powering on the printer. 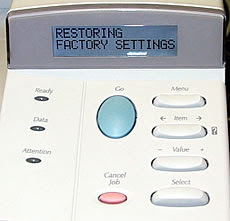 HP 2100 - To perform a cold reset, turn the printer power off, then press and hold the JOB CANCEL button. Turn the printer power back on and after all the LEDs come on release the JOB CANCEL button. A cold reset changes most system parameters in NVRAM to the factory defaults. The JOB CANCEL button must be released within 20 seconds after all of the LEDs come on; otherwise, an NVRAM initialization is performed instead of a cold reset. Turn the printer power back on and continue to hold GO until the Attention light turns on. The device lights will begin cycling from front to rear. The cold-reset process will run until completion and the device will go to the ready state. Turn the printer power back on and continue to hold GO until the Attention, Ready, and Go lights turn on. The device lights will begin cycling from font to rear. The NVRAM initialization will run until completion and the device will go to the ready state. Turn the power off and hold the reset button (button closest to the back of the printer) for LESS than 20 seconds while turning the printer on. Turn the power off and hold the reset button for MORE than 20 seconds while turning the printer on..